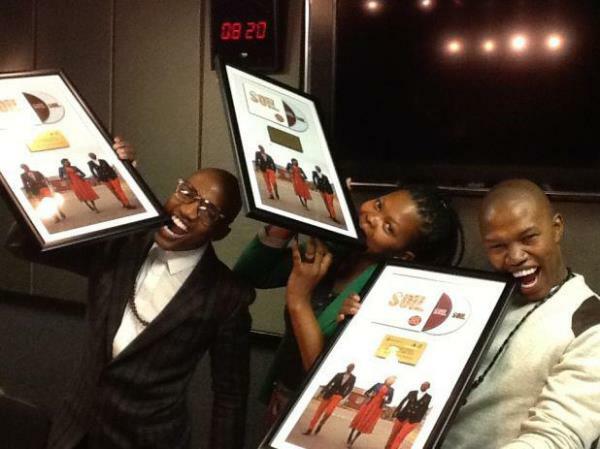 Kasi Soul Acapella group The Soil has reached gold status for their self titled album. The group which comprises of Luphindo Ngxanga , Buhlebendalo Mda and Ntsika Fana Ngxanga tell us about where it all began, where they are today and where they are hoping to go. We got to know the newest acapella sensation. It’s a group that is based in Soweto with primarily four members (God being the fourth member) but we also have two additional members with extraordinary vocal ability, Asanda Mnqiki and Twarelo Maluka, occasionally joins us. We met back at Tikelo Secondary School in Soweto about seven years ago. We used to gather as students and showcase our talent whilst cleaning our classrooms. And that is basically how the group met and by the grace of God we still going strong. So, how did the name The Soil come about? It came in a similar fashion like all of our songs come to us. It’s the name that chose us and sort of blended with the music that we’ve been blessed with. The soil is very raw and basic and those two characteristics relate directly to the music that we do. Our love for music began from the moment our mothers gave birth to us. We would like to believe that us crying in that labour ward was us singing. So already we had tapped into that calling. To us it’s more like an anointment from the lord. We grew up in families that were very musical that used to play songs from Brenda Fassie, Mariam Makheba, Busi Mhlongo. Those were people we grew up listening to and the influence and direction of this Kasi Soul music we doing comes and sterns from sounds that they’ve been blessing our parents with. So our love for music has always been there. It’s quite funny how we didn’t even endorse this talent and say this is the target market we want to present whatever we have to offer. We only focused on making the music sound great firstly in our ears and pray people will love it. It’s amazing to realise our music has an impact from 5-year-old kids to 90-year-olds. It’s really crossover music basically every one. What are you hoping to achieve now that you in the music industry? This music to us is not just a beat-box, melody and a few lyrics. It’s melodic medication, we know the power of the music especially coming from a sacred source that we believe in so much. It heals people and we hoping to present it to everyone. In a few years from now we hope to open The Soil Academy for those who want to endorse art as their 9 – 5. Talking about 9 – 5 which you are not doing, how did your parents react to you choosing this career path? We are so blessed with supportive and understanding parents. It’s been a beautiful journey and our parents respect what we doing and love. It’s not like we didn’t study, we did but you cannot run away from your calling, it’s just there and you have to do it. We sat down with our parents and explained and all they did was support and they still do. We are glad that people are seeing what we are about now. It’s hard to do a job and not enjoy it. It’s a self-titled album The Soil with 12 tracks and one of our tracks will feature in a movie starring award winning actress Halley Berry called Dark Town. And we worked with Toya Delazy amongst others whom we just connected with. Look out for our video early next year.